Home // Restaurant Reviews // San Francisco Restaurant Reviews // Pomp and Circumstance at Acquerello? Hey! I Thought this was Supposed to be Italian! Pomp and Circumstance at Acquerello? Hey! I Thought this was Supposed to be Italian! Never having been treated to a full tasting menu (+ wine pairing) at an upscale Italian restaurant, I was quite excited to finally get in touch with my Italian roots and try (what I had heard to be) the best in this field in SF. While parts of the dinner were outstanding, my overall impression was that the food was very hit and miss. Much like Gary Danko, I think if you order the right things, you could have a meal that will blow your socks off. When I order a tasting menu, I think of it like a challenge to the kitchen - I'm telling them "Give me your best shot." And, while some courses made me drift into a dream world of magic, the majority of them were just tasty and well-executed. For example, I feel like there is a limit on how good olive-oil poached halibut can be. For me, even if it is done perfectly (which it was), it is never going to be as good as say, rabbit with morels. So, having said halibut be our final "fish/meat" course of the evening left me wanting more. Kind of like when your favorite band ends their set with some random, unexpected song, and then the concert is over. Some of the food was just simply a miss. The "chefs specialty" was a rabbit meatball with no flavor whatsoever...not the best way to kick off the meal. Likewise, the spinach ricotta "ravioli" was fairly average. 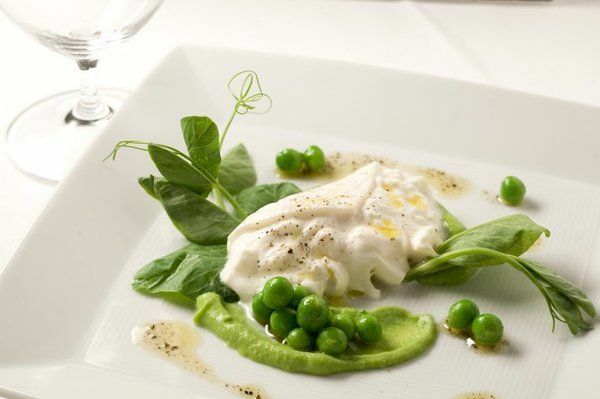 On the flip side, the burrata with English peas and olive oil made me squeal with joy. I don't even like peas. In fact, even when they are not a central ingredient, they can ruin a dish for me. However, the way they were prepared with this course was so magically delicious, and they so perfectly matched the freshness of the cheese that I couldn't help but fall in love. Having been relatively underwhelmed for part of our meal, we actually added the foie gras pasta as an extra course. It was maybe the best decision I've ever made in my life. This dish was mentioned as one of their specialties and is definitely a must-order. If everything had been this good, the tone of this review would be vastly different. Finally, the service was what it was supposed to be. The waiters were generally attentive, but didn't really engage us on any more than a purely professional level. I wouldn't say it was uptight, it was just...distant. In the beginning of our meal, we each ordered a glass of champagne while reviewing our menus - glasses which didn't show up until we inquired about them twice. To make up for this mistake, they not only offered them on the house, but the extra pasta course we requested was added in for free. If I have the chance to go again, I would design my own 5 course meal, and I have no doubt that I would be highly impressed. However, I think if I had the chance to go again, I would tell my date to put that money aside and save it for a trip Italy! The best Halibut I ever had was fresh from Alaska. It just doesn't get better! This is Vince, i hope you remember me, i met you at SF chefs food show as a rep from Acquerello. I just wanted to tell you again it was great meeting you again, and maybe sometime we can get together to discuss food. Any who, god luck in your food adventures through the city, I'll be reading along as you post. I definitely remember you! Of course, we talked Italian food, how could I forget?! Glad you found the blog =) Wonderful meeting you, maybe see you soon!